We woke this morning to find another 3 inches of snow on the ground, so what better recipe for today? 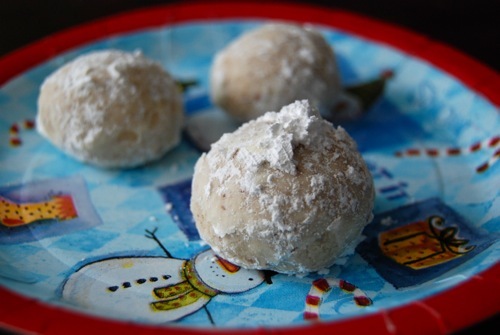 These little snowballs may look hefty but are tender and delicate, with a pecan-flecked dough. Much like a powdery snowball, they have a tendency to crumble (especially when warm), so be extra careful when rolling them in the powdered sugar. You can chop the pecans by hand of course, but save yourself the hassle and use a food processor. This recipe is so easy and delicious (and so low in sodium!) you’ll find yourself making these after Christmas is long gone. Many thanks to Judy W. for sharing. Yields 3 1/2 dozen cookies. Preheat the oven to 325 degrees. Get out a couple baking sheets and set aside. In a large mixing bowl, cream together the butter, sugar and vanilla. Gradually add the flour and chopped pecans, beating until combined. Shape dough into tablespoon-sized balls (a small ice cream scoop works wonders here). Place balls slightly apart on the ungreased baking sheet. Place baking sheet on middle rack in oven and bake 20 minutes. Do not brown. 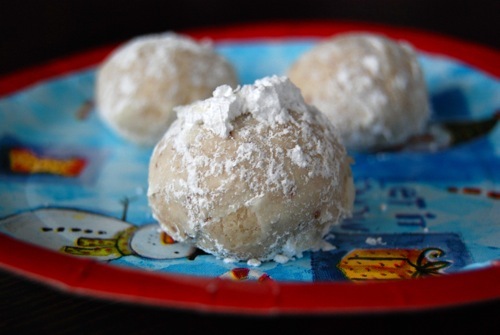 Remove from oven and very gently roll warm cookies in powdered sugar. Place on wire rack to cool. Store in an airtight container. This entry was posted in Christmas, Christmas cookies, Cookies, Dessert, gift giving, Holiday baking. Bookmark the permalink.